It’s almost Thanksgiving, which means it’s time for White House staffers to prepare for Christmas decorating to start in a few days. Yesterday afternoon, Melania and Barron Trump both appeared to represent the White House by accepting a fresh Christmas Tree from Wisconsin. 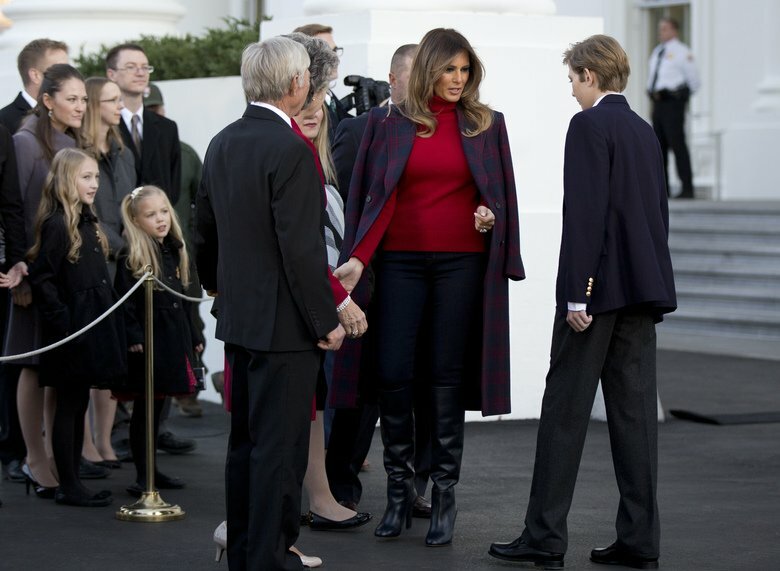 Melania looked lovely and comfortable in a slim fit cranberry turtleneck paired with a wool coat, jeans and slouchy black boots and Barron Trump is already taller than her, if you remember she’s wearing three inch heels! Barron is usually kept out of the public eye, but it’s nice to see him participate here, especially given that Christmas is such a family-oriented holiday. It remains to be seen whether he’ll be present at the pardoning of one of the turkeys (named Drumstick and Wishbone) today. 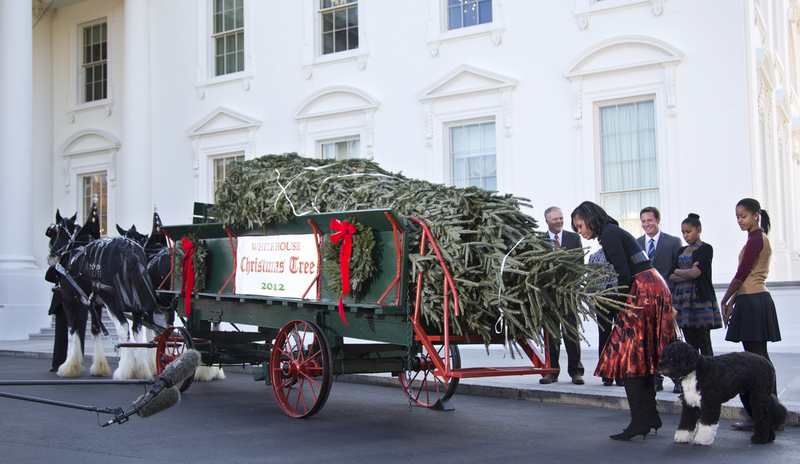 The tree was raised by the Chapmans of Silent Night Evergreens from Endeavor, Wisconsin, who won the most recent National Christmas Tree Association tree contest, which has been the source of White House Christmas trees since 1966. Compare this scene to last year, when two matching black Clydesdales visited the Obamas, with Michelle wearing that back brace and holding a Portuguese Water Dog that doesn’t seem too comfortable with the draft animals. I’ll assume the horses and handlers are from the same farm because of the similarity in the horses’ tack and the wagon. In 2016, for Barack’s last Christmas in the Oval Office, the Obamas decided it was appropriate to hang up Christmas ornaments with the face of Mao Zedong, the Chinese communist dictator who killed 100 million of his own people through starvation. Ornaments to Mao! The biggest murderer of the last 1000 years! The fact that they also hung up a portrait of lyin’ Hillary Clinton as part of the decor is insulting, but that they celebrated the most vicious, horrible person to curse this earth in centuries should’ve caused riots. May as well cover the White House in Swastikas if you’re going to celebrate murderous jerks. 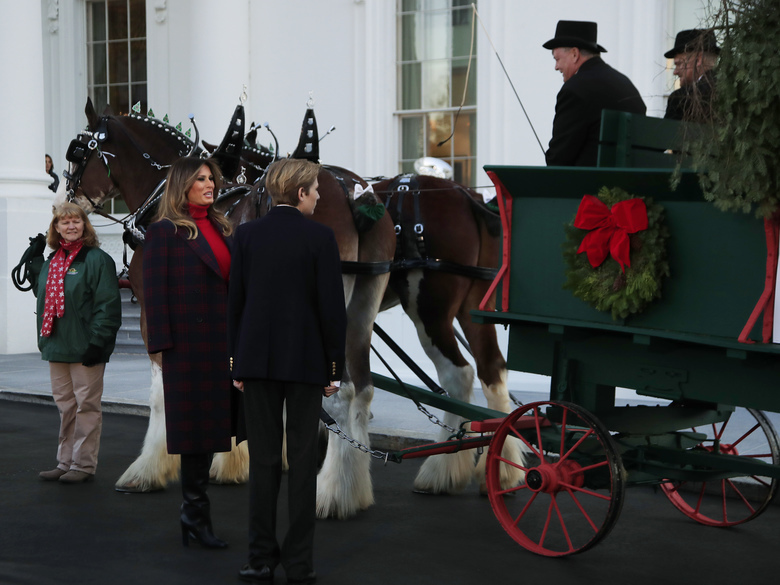 Unfortunately, after some searching, I couldn’t find the names of the two beautiful hitched Clydesdales or the name of their trainer and farm, but if you look close you can see that their manes and tails were braided up with little Christmas trees and green bows. Must’ve been a busy morning with a lot of grooming! I notice neither of them were wearing manure bags, so you know some poor guy was standing off to the side, nervously holding a shovel.